The West End Business Improvement Association (WEBIA) is a not-for-profit society representing the interests of property owners and businesses on three commercial streets: Davie Street from Burrard Street to Denman, along the full length Denman Street, and up Robson Street as far as Jervis Street. The WEBIA’s mission is to ‘brand, promote and revitalize the West End.’ The association includes over 730 business and just under 200 property owners. The business categories include restaurants, retail, services, accommodation, beauty/health/fitness, and nightlife. Construction of the Jim Deva Plaza started February 2016 and will continue through the spring with an opening targeted for July 2016. A Plaza Stewardship Committee [the ‘Committee’] has been formed to assist in the development of a management and programming strategy for the space, and includes representatives from WEBIA, the City of Vancouver (CoV), community groups and adjacent businesses. The plaza should be clean, safe and well-lit with a sense of security in the space any time of day or night. Programming, events, public art and educational elements should reflect the local community, including recognition of the LGBTQ community and Jim Deva’s life and legacy. 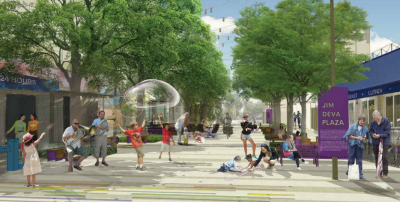 The plaza should have a balance of active and passive experiences, and should draw people in when it is not programmed with a dynamic mix of people watching, eating, resting, learning and respite from the intensity of Davie Street. The plaza should be an inclusive, welcoming and inviting destination in the West End for residents, workers and visitors of all ages and abilities, and should be public space at all times with no fees charged to get in. The Plaza Coordinator is a dynamic individual(s), who may be an independent contractor or be associated with a community group or event management company (or similar). The Coordinator is knowledgeable and passionate about programming public spaces. The role is part time with specific hours to be determined based on available budget and the needs of the Plaza. including information on how to apply.